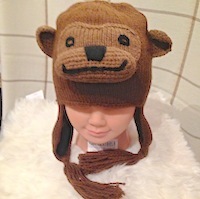 These handmade, 100% alpaca whimsical monkey hat make little ones smile! Liven up pretend play or turn autumn walks into amusing adventures with these adorable animal hats. They are fun to wear, and make everyone happy. 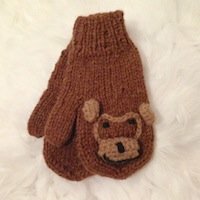 With an added fleece lining they are incredibly warm, and will make wearing a hats, loads of fun. One customer reported that their child does not want to take it off! Choose from other; our tiger-cat, a funny bug-eyed frog, a bashful brown bear, ducky-duck or the bunny, moose, fox or get them all for many hours of dress-up fun. Do not miss the matching mittens for a fabulous set for the chilly winter months! Size: One size fits most children ages 1 to 6/7. May also fit many older. 100% Alpaca, with fleece lining. Handmade in Bolivia; work-at-home moms in the Bolivian Andes are paid fair wages to hand knit these wonderfully soft, incredibly warm, lightweight alpaca hats.